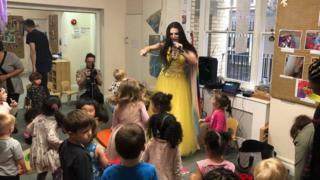 An event at which a drag artist will read stories to children has sparked outrage on social media. Alyssa Van Delle has been invited to Taunton Library in February as part of LGBTQ+ History Month. The performer will read from children's books that cover LGBT themes or challenge traditional fairy tales. Event organiser Tom Canham said he was "quite surprised" at the criticism as previous events had been warmly received. One critic of the event, Rebecca Lush, wrote on Twitter: "Keep sexuality in the bedroom, not in libraries, and certainly not for pre-school children." Another, Louise Paine, wrote: "Drag is adult entertainment, an over-sexualised, misogynistic portrayal of women, usually by gay men. "This is not suitable for young children, especially when they are reading them stories which tell them they may have been born in the wrong body, an impossibility." The tour has been running for two years, performing some 50 shows around the UK and reaching about 8,000 children. "They love it - there's glitter, feather boas and they think it's amazing," said Mr Canham. He said Van Delle had already done 27 shows and her act was age appropriate, as any professional entertainer's would be. "LGBT literature is close to our hearts," Mr Canham said. "If you read reports, they show LGBT and homophobic bullying in primary schools is very high, as children are not being introduced to [the literature]. "This allows for it to be discussed and introduced." The tour is also working with Islington Council to introduce a range of books for primary schools covering issues such as gender and sexual identity. The aim is help youngsters increase their understanding and acceptance of the LGBTQ+ community. Somerset County Council, which runs Taunton Library, has declined to comment.